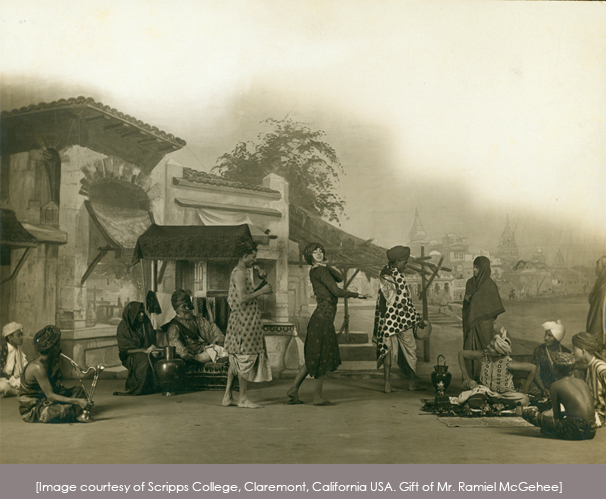 On the Trail of Ruth St. Denis has received generous support through the cooperation of three institutions in the United States that are invaluable sources of archival materials related to Ruth St. Denis, Ted Shawn and Denishawn: Scripps College in California; Adelphi University in New York and Jacob's Pillow Dance in Massachusetts. While in India the crew was also graciously hosted by the Oberoi Grand Hotel in Kolkuta where Ruth St. Denis had stayed as a guest of the hotel in the 1926 (it was known as the ‘Grand Hotel Calcutta’ at the time). Norton Owen, Director of Preservation (Jacob’s Pillow Dance Festival, Massachusetts, USA). Barbara Andres for making her extensive collection of Ruth St. Denis photographs and memorabilia available for research purposes and for use in the film.